@pelrigg: I couldn't post links at the time, but now I can: http://www.youtube.com/watch?v=daMQh9ixa5s. @tresoldi: Nice to see you here! [heresy]As wowterful as the OTT is, it might not be the perfect place for longer discussions on Beanish. [/heresy] Your blog or a wiki (of which there is only One True) would probably be better. Important results would be reported here, of course. OT (is that even possible in the OTT? ): Sails up, engine cut, doing 5 knots (what's that in cues per newpix? ), wife's at the helm so that I can finish my post. Perfectly alright! Edit: Wow! Pagepope. Neat! Decree: I want seaish1 seaish2 OTTifications! 2: Not seaish, but seaish! Last edited by Hel-G on Fri Aug 02, 2013 9:55 am UTC, edited 1 time in total. Neil_Boekend wrote: 1. Price. Depending on what you want a Wacom costs EUR 50 to EUR 2500. Pen and paper beats that any day of the week. 2. The line you draw doesn't appear on the surface you draw on. This wasn't a problem for me because I wasn't all that used to drawing pen and paper and it was far more natural than the mousework I did before. A Wacom tablet has an extremely high sensor resolution. Far more than usual HD screens (5080 DPI and a couple of inches by a couple of inches makes for an incredible resolution). An Ipad has enough sensor resolution to detect where your finger is. You don't need a high resolution for that. Thus drawing on an Ipad is probably far different than drawing on a Wacom. Back when I had the time to work with my Wacom, the Gimp was far better with a Wacom than Photoshop, although a Wacom under Linux was difficult to get working. This probably changed a lot since then. Back then the pressure level of the Wacom didn't affect a thing in Photoshop, but it worked marvelously in the Gimp by default. Theoretically the Gimp could handle a mouse with pressure levels, although I don't think those ever existed. There are two main obstacles when working with a tablet. The first really can't be helped, but needs some time to adjust to. As Neil said, at first it is awkward for the strokes to show up on a different surface than you draw on. The second is a matter of size. This is why I did not recommend one of the very cheap tablets. It's not only that the drawing surface is different, but also the size of the drawing is different. So with a rather small tablet and a decent sized monitor, you've got a problem. The ideal would ba a surface area excactly the size of the monitor. This is not feasable (at least not with the money we are talking about here). But in my experience anything better than 1:4 works rather well. Being a Linux only guy (at least at home) I can say that the Wacom works beautifully with the new distros (I use Ubuntu). Both The Gimp and Inkscape have no issues with my Wacom Intuos 4. On other news: I already said I don't like FB and will not get an account there. On the other hand, I somewhat reluctantly adopted G+ (peer pressure can be a rather insistent thing). So if there is any interest to have a safeline for the community there as well, just let me know and I will PM my account there (don't want to have it scrapeable here). I will try to update my statistics, but this posting by cameroda is really badly broken and can't be fixed automagically (nope I just use tidy for this, not real magic, but it comes close), so I have to do some manual cleanup. If cameroda reads this: Please fix. Finally reached [special comic number]!! I'm almost at [next "round" number]...but nowhere near [current page number]. This is hard. 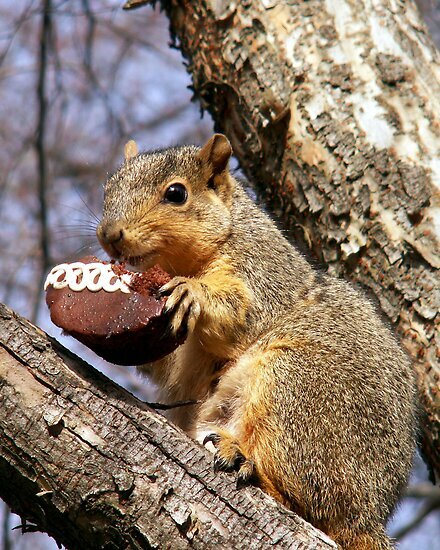 Aww, your mascot! I hope you get visitation rights. P.S. The server was down, with a 504 and 503 error. "No server found" was a very scary thing to read! I also have a father who is both an artist and technically 'unskilled', shall we say. Even with the disconnect of drawing here, and seeing the lines appear over there, and unfamiliarity with the graphics program, he managed to draw a Viking, and make it actually look like a Viking. On the cheapest Wacom around. A tablet is no substitute for skill, but if you have the skill, any tablet will do. Holy Ch*rp! I don't have enough burgers for all this ketchup! I'm still at stage I.IV (denial with a pinch of depression), so I've got an othercomic-related prediction: the discussion of mustard somehow annoyed The GLR, so He decided that rather than let us Wait for it..., He'd made us RUN.... Thus ended Time, early. Pessimistic predictions are good luck, right? Just in case they aren't, alternate prediction: "Time, part II" will eventually be revealed when we have solved the puzzles already placed before us, and we are once again ready to Wait for it.... Thus resumepeats Time, at a higher difficulty. So many nice comments about my recording, thank you! It really means a lot to me, especially since I knew it wasn't really a great take. (rvloon, I do know about proper breathing and have taken voice lessons, but like anything else it needs to be practiced. I just haven't been singing much lately. )(Not that I wouldn't have more to learn!) Jose, I loved your line that there are no words for it, even in Beanish. Taixzo, it is a good production of Les Mis, but I'm not singing in it, just hitting things. And ggh remembered what lmjb stood for. There were so many other wonderful comments, and I was really touched by them. And I really meant what the lyrics said! Great manips from charlie and ximenez. tresoldi reveals himself as our mystery linguist. The blog might be a good place to sort things out, but if you could post updates here as well, that would be awesomeful. Great ottifications from magma pixie (welcome!) and dawnfire. pelrigg, checked out that wowterful Hendrix video. No idea what that language is either. Caught up on Acts of the Clerics. Wowterful and awesomeful as always. Aluisio, I was confused--I was thinking of your other story, which I did read. Can't wait to see more of this one. And buffygirl, I want to re-read your idea to get all the points you brought up, and I have no idea how any of that could be done, but it sounds like a treeish (and seaish) and exciting project. I think there was other stuff, but I had some trouble with my browser and lost some quotes. Plus it's 3:20 a.m.H and I really should be a-coma. So, molpy down! No kitties. What, the baby mouse isn't enough? I used to have a little mouse just like this. Did mscha's supply of newpix dry up? yappobiscuits wrote: I should've molpied down some time ago, but I ended up staying up to write the music to BlitzGirl's poem instead, while the idea was fresh in my head... but I've finished that now, so molpy down time. Cause I may or may not be doing something similar. Hmm, I hope I can have a nopix without the straight jacket todip. Typing with my nose is difficult. Welcome de-lurkers! Always good to see more joining us. It is especially nice to have Tresoldi in our midst, now. Welcome!! Latent22 wrote: Also if you already are good at drawing on paper then you will want to get a cheap drawing tablet of some kind so you don't have to try and teach yourself to draw with a mouse which is a lot harder. I tend to disagree. I dabbled a bit with creating graphics on the pc (well I dabbled with almost anything on the pc), but made the mistake to buy a cheap drawing tablet. Though a lot - a seaish lot - better than the mouse it is still really limiting. I finally bought a not so cheap wacom intuos, which i really can recommend. Don't get the smallest one. The medium ones are great, the biggest ones don't deliver as much bang per buck (except you really need that size [twss]). I tried using a stylus with an iPad once and found it terrible. From my experience, nothing beats a good old pencil and paper. If you want to digitize it, just photo or scan it and then you can start doing the CG effects. To be fair, the iPad is an awful device for drawing (I have one), and the bulbous stylus designs that go with it are terrible when it comes to accuracy. But a decent graphics tablet to use with a computer, plus some practice, can give the old pencil-and-paper a run for its money. I don't know if I'd recommend it for the casual artist, since a good-quality tablet can be a couple hundred dollars, but if you're a hobbyist and you can see yourself doing a lot of digital drawing/painting, I'd go for it. And I'm ninja'd! Really? I've never had the opportunity to try a decent graphics tablet of any kind... I'm surprised to hear they can be better than traditional physical drawing tools? 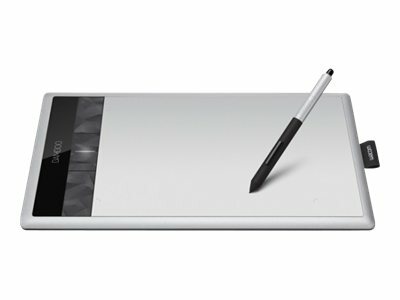 In what ways does the graphics tablet win over real pencil/charcoal/paint etc etc etc? ETA: Also, are we talking about surfaces that also display what you are drawing, or just input devices? If there is no display other than the actual screen, does that cause problems or is it easy to keep track of where you are? A Wacom or equivalent gives a lot of possibilities that pen and paper doesn't, and has a lot of disadvantages that pen and paper doesn't have. I am not able to draw myself, but I have used a Wacom in a few places to photoshop or Gimpcake. Thus I do not know all the advantages and disadvantages, but I'l give it a shot. 1. You can program different things on it, like different colors whether the side button on the pen is pressed or not. Makes for quick and natural changes. and a lot more. This means you can control these things quite naturally. 3. Since you are working on a computer, saving is easy. A cup of coffee over your keyboard is an irritation, but a cup of coffee can destroy a pen and paper work. Wacom tablets and pens seem to be quite splashproof. The tablet is lifted a few mm off the ground by feet and there are no seams on the top. I haven't tried that feature yet. 4. When I last worked with cheap consumer grade scanners they usually didn't work. Scanners are frustrating things, although they may have been improved greatly. 1. Price. Depending on what you want a Wacom costs EUR 50 to EUR 2500. Pen and paper beats that any day of the week. A graphics tablet is good for media that is not only created digitally, but consumed digitally, like a webcomic or fanart. I do know many people that still like to rough-sketch their concept on pencil-and-paper first, then digitize that and refine it using their pen tablets later (I do this myself on occasion). But as I've grown used to tablet-drawing, I view this more and more as an additional step in the process that I try to skip as often as possible. My own tablet story: I first started making digital art around 2006 or so, strictly hobbyist. 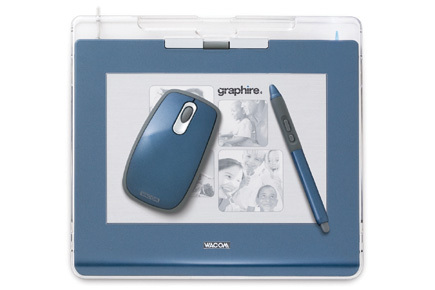 My first tablet was a Wacom 4x6" tablet (I believe it was of their Graphire 4 series; they don't make these anymore). I used it with my parents' home PC, my laptop, and the Macs used by my school. It was a good little tablet and actually still works - I have it stashed in my electronics drawer right now. The key word, though, is "little." 4x6 is very small, and reduces your input to the size of a large index card. In 2008 I upgraded to a Wacom Bamboo Fun with drawing area of 6x8", and noticed the improvement immediately. Less wrist strain, cleaner lines, etc. This was also a good graphics tablet, and I still have it as well. However, it met with a horrific moving accident in late 2011, and gained several etches on its surface. It's still workable, but inconvenient to use. I replaced it with the current Bamboo Create model, also 6x8" drawing area, which I am very happy with. This is what I used to make the Boom de Yadas and OTColored frames. It also has touch capabilities, but I usually have these turned off, preferring to use it just for the pen. If I'm not using it for the pen, I'm using it as a mousepad with my regular mouse. I've actually become so used to graphics tablets that when touchscreen-computer tablets first became popular, I was weirded out by them. (You mean you touch them with your hands? Your germy, germy hands? Ewww...smearing sludge all over the screen...ewww...) I have a couple-generations old iPad that is just a bear to draw on compared to my Wacom. Because I'm still just a hobbyist, I haven't really felt the need to upgrade to even a Wacom Intuos, the next step up in terms of pen tablets. A screen tablet like a Cintiq would be amazing, but it's fifteen times what I paid for the Bamboo. Right now in terms of tablets I'm still a happy molpy. Last edited by Ximenez on Fri Aug 02, 2013 12:15 pm UTC, edited 2 times in total. @Ximenez: Yay! Cueball sees his shadow! Does that mean six more wips of newpix? @dawnfire: Treeish "We Must Be Strong" and "One True Thread" ottifications! @magma pixie: Welcome and thanks for the Firefly ottification! Yay! Thanks, Kieryn! I missed having newdata! The smileys page is full of grouphugs now! mscha will be happy - I finally overtook him on the Credits list. And it looks like the End of Time had the most posts in a single dip for the first time since the newpix changed to longpix. This OTThercomic takes on another meaning if you see Cueball as an author-insertion persona. We've had two 24-hour cycles (colored blue and green), it's too early to tell whether we're in a third one now. No idea what's up with this... Perhaps every time the GLR finds out we figured out the pattern, He changes it? Perhaps GLR just waits until a poem is made with the new 24-nopix rhyme scheme, then changes it after that. lmjb1964 wrote: BlitzGirl, is "Rest with Me Here" an original poem? It's beautiful! Thank you! Yes, it's an original poem, using the second epilogue cycle rhyme scheme. Hel-G wrote: OMR, the great BlitzGirl herself has created a picture based on my OTTification! I'm honoured! You seem to have figured it out for yourself, but my translation wasn't entirely correct. "Herren Randall" means "The Lord Randall" (definite articles are postfixed in Norwegian1814) so it is quite correct to add "great". "Den store Herre Randall"1905 was simply too long to be singable, but I didn't want to commit heresy by omitting "great". You're welcome! I took a few years of German classes, so Norwegian usually looks vaguely familiar to me, even if I can't always puzzle it out. MOLPY UP! BlitzGirl,, Molpy Up. I, BlitzGirl, Knight Temporal of the One True Comic, bestow upon thee, pelrigg, the Knighthood Temporal (whether you like it or not), in recognition of the founding of the Beanish terminology, "You're a molpy! ", and a warmly encouraging yet OTTerly humble soul! Molpy up, and continue Waiting for it! I, a most humble Timewaiter, accept from you BlitzGirl the First: Cardinal Tempus Viator, The Great Pilgrim of Time, The Most True Follower, Sister in Time (etc. etc. etc. ); the honor of Knighthood Temporal. I will endeavor to uphold the Mighty Standards (ni, ni, ni, ...) that accompany this Most Exalted Position, and will not besmirch this Holy Order. I will Follow The Command of "..." and be perplexed when needed. I will follow the Command of "Run" and scurry as swiftly as warranted. And as always, I will follow the Great Command "Wait For It" even as we redefine what waiting is. I thank you, good lady, and Randall the Creator for this blessing. A salute to Sir Pelrigg! lmjb1964 wrote: OK, so, here's the recording. And now it seems that Time will end, where will I go, where will I post to? The alt-text says "The End," and I feel like I lost a friend. Sometimes I'd get online at night when everybody else was sleeping. I'd read each post and be so happy with the company I'm keeping. So if the end is here, I hope you all will still stay near. And my joy was like the sea and not the river. And so I hoped that all of this would carry on forever. That one day The One True Comic had to end. Now it's here, this truth that I denied. Still I say I will wait for it. We're not gone, we may stay here forever. But now of that will matter now that we are friends, not strangers. Without you, my world would have been poorer. This thread is full of awesomeness I never would have known. I waited, but never on my own. That is so lovely, lmjb! Wow! Your voice is beautiful. And the ottification is awesomeful! If there's to be a meetup in Marseille/Chateau d'If I'd consider making the trip (but I better start saving now!) Or Cape Town. Or Madagascar. lmjb1964 wrote: There was that map--Kieryn, did you put that up?--that showed where all the TimeWaiters were. Maybe this is somewhere in my future (blindposting from about 4 NP back) - would so love to see it! Don't worry - I'm certain any meetup plans will be posted here on the OTT, too. There are less than fifty OTTers in the Facebook group, and 1324 people have posted here in the OTT according to Kieryn's Credits page. The One True Thread is still the One True OTTer Method Of Communication (OTOMOC)*. *Yes, I put an acronym in an acronym. Would you like some recursive Sandcastle with that? 7, I had forgotten about that GIF! And: Thanks for the compliment, BlitzGirl! Last edited by Ximenez on Fri Aug 02, 2013 1:01 pm UTC, edited 1 time in total. BlitzGirl wrote: Ooh, neat, Ximenez! I love the new acronym. really rolls off the tounge... I say it OH-to-MOCK. For all you Megball shippers (Megballers? ), this is what really happened in m2693. Someone, it seems had a flashlight (torch). Spoilered for basic decency. Huh. For some reason I was expecting more Beanie action (must be off-flashlight). Ximenez wrote: Thanks for the compliment, BlitzGirl! And happy future birthday! My first Wacom was a Christmas present. Apologies if this has already been relayed to the OTT and I missed it, but Wired has an article up with some quotes from the GTR himself (among other things confirming the Antares supernova and confirming how hard to crack Beanish is meant to be). yappobiscuits wrote: 4! I've shot all the way up to 9th! I've been having a terrible week at work and haven't had the energy to construct a post in a couple days. I've been reading everything, though... and listening to / reading / seeing all the filks makes me smile. Often. I'm working on a few other OTTifications but don't know when I'll have the chance to post them. To all the Blitzers! Keep those past-posts coming. Those have been really 4... especially throwing forward things you know are momentous NOW but we didn't know any better back THEN. I like the idea of understanding the whole comic and thread already and then blitzing. May GLR be with you. I haven't felt the need for proper ketchup posts since TFWMNBN, but there is much I wish to reply to today. However first, I need to read that wired article and stare at that sandcastle gif some more. 1. Clear Square dot and possibly some small writing - Bilbao? 4 Another Square dot and some small writing - New Rome? I disagree. we are still getting pix, even if they are reruns. therefore, I dub these, the "days of Semi-random repix"
and nominate repix for the term we use. charlie_grumbles wrote: For all you Megball shippers (Megballers? ), this is what really happened in m2693. Someone, it seems had a flashlight (torch). Spoilered for basic decency. Wow! Each verse captures a different era so well. And on top of that, the tune of one of the greatest shows of all time. NoMouse wrote: So long, and thanks for all the fish! I hope the OTT will not be dead when I get back! Have a good heresy holiday NoMouse, I'll make sure to leave the porch light on for you! Anyway, I am glad you find my posts interesting, I will try to go on in my free time. And I must say, it was amusing to read people speculations about that mysterious blogger. Eternal Density wrote: If I had a quarter for every time I had a nickel, I'd have six times as much theoretical American money. Done. I went with being creepily specific, so if I walk across the room it will become out of date. GLR wrote: Maybe I’ll find a way to sneak a bit more of the language into another xkcd comic. Last edited by HES on Fri Aug 02, 2013 3:37 pm UTC, edited 1 time in total. tresoldi wrote: I hadn't read the OTT today, and I guess I have to present myself. I am Tiago, the author of the Beanish language blog (by the way, it's great to have a domain pointing to it), and I am user Tresoldi in Wikipedia, just like someone guessed. I am really glad you liked what I did, but as someone posted here I am just developing on the work found on Wikia. I am not a professional linguist, but have studied historical linguistics both in Brazil and in Italy; my "true" fields, however, are computational linguistics and especially literature (which is my "truest" field). Very neat stuff on your blog. I'm really interested to see what you can make of it. Well, in my defense I could say that the projects I worked on are more in the field of natural language processing than computational linguistics, but Randall wasn't entirely wrong about that one (and as Ph.D. student in literature, he is completely right about xkcd 451 -- I don't seem to have enough "karma" to post links, sorry). Great Lord Randall wrote: In my comic, our civilization is long gone. Every civilization with written records has existed for less than 5,000 years; it seems optimistic to hope that the current one will last for 10,000 more. And as astronomer Fred Hoyle has pointed out, since we’ve stripped away the easily-accessed fossil fuels, whatever civilization comes along next won’t be able to jump-start an industrial revolution the way we did. I got suggestions from botanists and herpetologists, and I had a file with details on every species the characters encountered or talked about, like dwarf palms, juniper trees, horned vipers, and sand boas. The Earth’s axis wobbles over the millennia, and some individual stars move visibly, so I used a few different pieces of astronomy software–with a lot of hand correction and twerking–to render the future night sky. When the Sun sets in the night sequence, one of the first things you see is the gap where Antares should be, which was the first clue that this is taking place in the far future. Later in the night - which lasted for several days of real time - more astronomical details let readers pin down the date more precisely. Maybe I’ll find a way to sneak a bit more of the language into another xkcd comic. Africanists forever! Of course GLR knew what he was doing! Anyway, see you all when I get back! I was just about to ask if someone is proficient with image manipulation and is able to improve the map, or at least give a more readable contrast (I tried just messing around with standard contrast controls, but it didn't help). We should remember that in number 7 we can only see the end of the words. Besides that, Label 1 does match Bilbao, 2 could be Toulouse, 3 could be Lagos or Faro (from where Colombus sailed) and 15 is likely the Adriatic Sea (but it seems to me that someone had already pointed it). There was something very satisfying about seeing the Washington Post use the word "blitzing" in context, regarding the OTT. But to see Wired print "Beanish" in one of their articles is just so utterly fantastic! The GLR has provided us with additional clues (and a challenge! ), comparing Beanish to Linear A. I do hope he decides to use it again. @waveney Trying to decipher the place names on the Beanie map is also a good idea. I do not recall is those label have been specifically identified and analysed. I do recall that someone had suggested requesting the original frame from GLR himself, so that we might examine them at their original, higher resolution. Don't ask me. I retired. ANd I didn't even get killed off the day before. Way I see it, I'm ahead. and afoot, too. Dracomax wrote: Way I see it, I'm ahead. and afoot, too. And alive. Don't forget alive!